A rendering of the theme park. A new 20th Century Fox theme park will be built in Dubai joining a growing list of international parks. 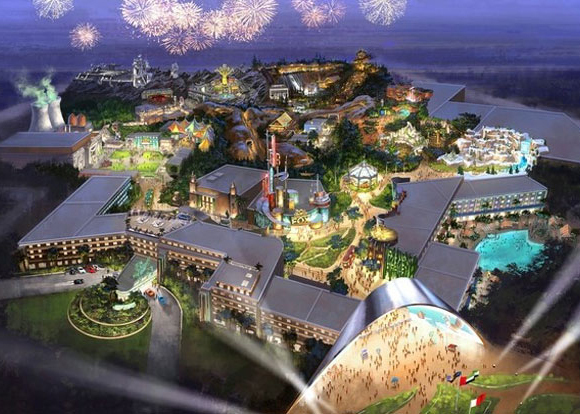 Al Ahli Holding will build the park alongside its Dubai Outlet Mall, which is close to Dubai Holding’s proposed Universal Studios Park at Dubailand – the original ‘theme park’ home in Dubai, announced in 2003 before the crash. Mohammed Khammas, the chief executive of Al Ahli Holding, said the Fox park would appeal “to different age groups from as young as four years old to 60 and above”. The company has signed an agreement with Twentieth Century Fox Consumer Products, which amounts to a global licensing deal to roll out branded theme parks, local news sources said. With an estimated cost of $850 million, the deal will also allow a roll-out of up to three additional Fox-branded resorts in territories outside Dubai. The theme park is set to open in 2018. To be built on a 372,000-sq-m site, Fox will bring to the city attractions based on its products and popular characters such as The Simpsons, Ice Age, Night at the Museum, Planet of the Apes and Titanic. It will also contain the world’s first Fox-branded resort hotel. Al Ahli Holding expects to attract between four and five million visitors to the Dubai project.